Horror is one of the few genres that can still have a massive impact even with a limited budget. Evil Dead and Bad Taste are now considered classics of the genre and both directors (Sam Raimi and Peter Jackson respectively) have gone on to become two of the most influential and profitable directors in Hollywood. They started with a small pot of cash and lashings of fake blood but now direct some of the biggest blockbusters imaginable. 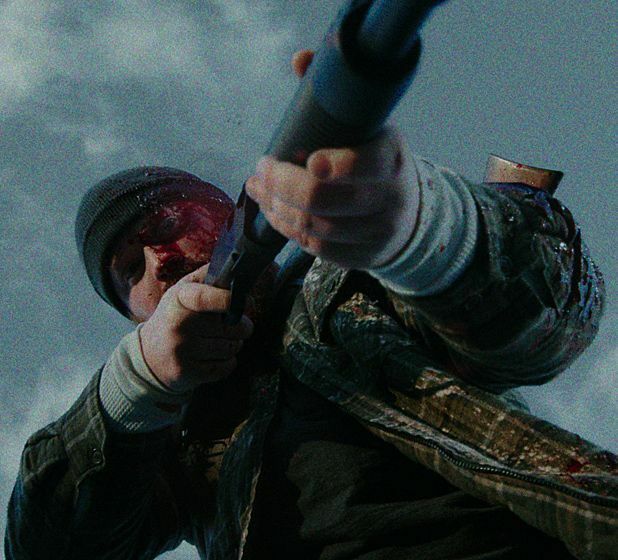 With just $50,000 writer/director Joe Begos has created a remarkable debut feature. By his own admission inspired by the two aforementioned movies Almost Human is a gory sci-fi / horror hybrid. Mark Fisher (Josh Ethier) disappears in a flash of blue light. His best friend Seth (Graham Skipper) is accused of his murder but as no body can be found all charges are dropped. Cut to two years later and Mark just as mysteriously reappears naked in the woods. But Mark's now possessed by an alien entity and sets out on a kill spree while trying to track down his former girlfriend Jen (Vanessa Leigh). All credit has to go to Begos. Not only taking on the writer / director role but also producer, camera operator, cinematographer and more (he even has a brief cameo). You would never guess they had so little money to play with, the final film looks better than some with ten times the budget. They won't win any Oscars but Begos gets some decent performances from the cast. It has a more serious tone than either Evil Dead or Bad Taste but throws in a decent amount of good old fashioned splatter utilising axes, shotguns and hacksaws and at 80 minutes it's perfectly paced. It's a bit rough round the edges but just wait for Begos to get his hands on some real money and we can expect something very special indeed.